ROY is a 1967 Yale grad. He studied City Planning at Cornell University and the University of Tennessee and obtained an M.B.A in Real Estate and Finance from the University of Connecticut. His career has been spent in municipal government and real estate and many of the plot points in the show are drawn from that experience. Issues include conflicts between historic preservation and economic development, eminent domain, planning and zoning approvals and Locally Unacceptable Land Uses. As his interest in music and theater deepened, Roy became a member and director of the Connecticut Songwriters Association, an ASCAP affiliate, a member of Theater Resources Unlimited (TRU) and a Dramatist Guild member. He has been recognized with some small awards from Billboard Magazine, American Songwriters Magazine, Great American Song Contest and Songs Inspired by Literature. His song "Yesterday's Backstreet Cafe" was recorded by Nashville artist Tracey K. Houston on her Songbird label. CD compilations of his songs; "American Brass", "Two Blue Moons" and "Roy O'Neil's Brass City Christmas" have been released on the Abrigador label and are available for download and streaming via Pandora, Spotify, I-Tunes, CD Baby, Amazon, YouTube and others. The show began as American Brass and was performed in 2002 as part of a community theater production "Broadway on the Green" in Waterbury, CT. After a series of rewrites and workshops the show title changed to Eddie and The Palaceades and it was a participant in three New York City musical festivals: the 2013 First Act Feedback Festival sponsored by TRU and MusicalWriters.com; Manhattan Theater Mission's 2013 New Musicals Showcase; and the 2014 Midtown International Theater Festival. Audience and critical response has been enthusiastic and positive. The show was awarded "Audience Favorite" at the MTM Showcase and received 9 "Best of Festival" nominations at MITF, winning the award for Best Director. In 2016 "Eddie and The Palaceades" won a Director's Choice Award from MainStreet Musicals. 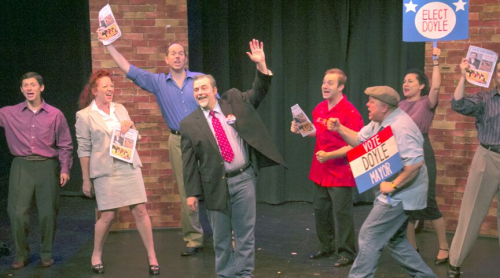 The show was next presented in a staged reading by Woods Hole Theatre Company and then there was a sold out full production at the Square Foot Theatre Company in Wallingford, CT. After the Square Foot show there was another workshop in NYC and another title change to Save the Palace. Roy's own name has remained the same throughout the history of the show.